When a stove-top fire occurs, one or more of the four fusible links will separate, releasing the cable tension. The tension spring then automatically opens the extinguisher valve assembly which discharges the wet agent through the piping system to the nozzles, and then to the range fire. The system can also be wired into an existing alarm panel showing system activation. This system is UL and ULC listed with a fuel shutoff and is listed with or without the pull station. House Fire Happen Everyday. Don't let this happen to you. Depend on the Guardian III ! 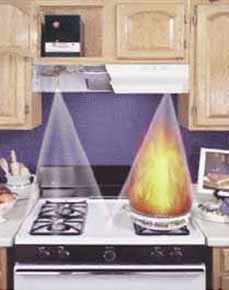 cooking is the #1 cause of home structure fires and home fire injuries. In 2008, there were 154,200 home fires that involved cooking equipment in the U.S., resulting in 413 deaths, 4,738 injuries, and $3.36 billion in direct property damage. -- Unattended cooking is the leading contributing factor. -- Thanksgiving is the peak day for home cooking fires. -- Frying is the leading type of activity associated with cooking fires. 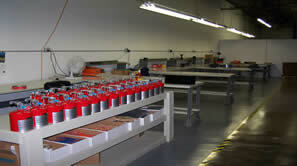 -- Electric stoves/ranges are more likely involved, compared to gas appliances. 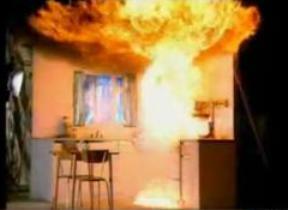 -- The CPSC found that 83% of frying fires began in the first 15 minutes of cooking. -- Under 5 years of age and 65 and over are more likely to be injured or killed. 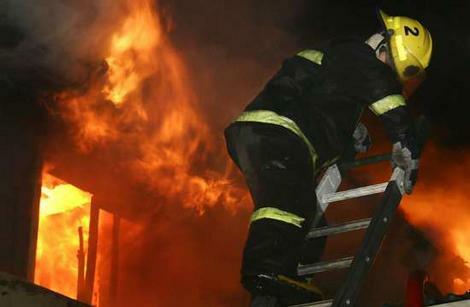 victims tried to fight the fire themselves. See more from the National Fire Protection Association (NFPA) on cooking fires (Click Here). can help keep you from becoming a statistic ! Guardian III operation. Water on hot oil is dangerous. *Click on either picture above to see a video. The Guardian III (G300-A) is a unique, state-of-the-art residential, range-top automatic fire suppression system for your home. It is also approved by Underwriter's Laboratories (UL & ULC) for the protection of residential cooking equipment in light commercial occupancies*, such as group homes, dormitories, day care centers, church kitchens, fire stations, break rooms, libraries, and civic group meeting halls. This self-contained system can be installed by a handy homeowner or contractor in under an hour. *Subject to state or local authority. Check with your local fire or building official for specific requirements. Basic system includes electric or gas shut-off, battery operation, and Owner's Manual with installation, testing, and maintenance instructions. Get a Price Quote or BUY NOW ! Compare the safety and security of installing this system in your home with the cost of any other accessory or furniture or even a year of cable TV ! makes for superior quality control. Send email to get answers to your questions. 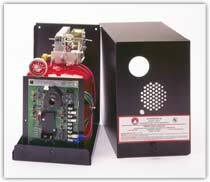 Consider the benefit of having this automatic fire suppression system in your home, child care center, or supervised adult care facility, or if you have mentally or physically impaired persons of any age in your care or in your home. If you survive a cooking related fire, the kitchen and the house it is in can be replaced, but what about your "home" and your pets ? Your photographs and irreplaceable items ? This unit may be ideal for a fire house, crew hall, or church kitchen. Walk the talk ! Be the example ! Set the standard in your community. Click here to see the UL listing. Click here to see more on kitchen/cooking safety. A small investment can buy you a lot of "peace of mind" ! THANK YOU VERY MUCH For Choosing FESCO!